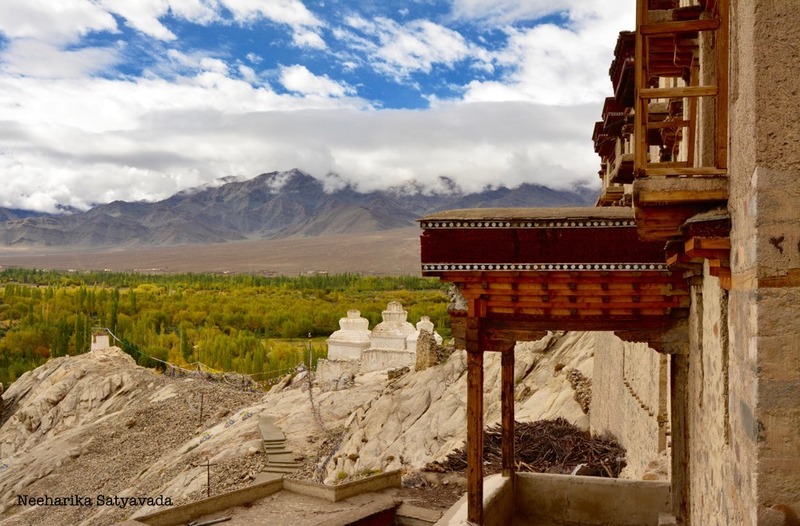 On the road from Leh to Thiksey, atop a hill, sits The Shey Palace and Monastery. It is by far the most picturesque of monasteries in India. Little surprise then that it was once the summer palace of the Kings of Ladakh. The views that the Shey Palace commands are like no other. Despite the persistently thick cloud cover that dogged us through our week in Ladakh, it made for some beautiful pictures. All you need to do is pick your vantage point! It is said that the lake right across the road, once mirrored the entire palace, lending its name ‘Shey‘ – meaning mirror – to the palace and the village. Though overrun now, it still is a thing of beauty and joy. & it is not just the setting, but the Shey Palace in itself which is stunning. The wooden accents to the doors and windows only add to the beauty of the facade and make for striking pictures. The monastery in the palace boasts of a large Buddha statue gilded in copper, brass and gold that spans across the two storeys of the split-level temple. So, you spend a good few hours not just paying your respects at The Temple of Sakyamuni Buddha, but also climbing around and exploring the hillside ruins in the crisp fresh mountain breeze. There are chortens and stupas, prayer flags and wheels at every turn & corner. Great Pictures. Especially that peek-a -boo through a window! Lovely pics…u hv captured the feel of the place beautifully! !